Immunofluorescent analyses were performed on P. falciparum 3D7 using anti-LplA2 and anti-aLipDH (aE3) antibodies (specifically staining the apicoplast of the parasites). Panel 1 shows staining of an organelle distinct from the apicoplast, probably being the mitochondrion. Panel 2 shows costaining of both antibodies, suggesting LplA2 is located in the apicoplast, and panel 3 shows staining of both the apicoplast and potentially the mitochondrion. Scale bars: 5 mm.Günther S, Wallace L, Patzewitz EM, McMillan PJ, Storm J, Wrenger C, Bissett R, Smith TK, Müller S. Apicoplast lipoic acid protein ligase B is not essential for Plasmodium falciparum. PLoS Pathog. 2007 Dec;3(12):e189. Localization of apicoplast and mitochondrial LipDH. 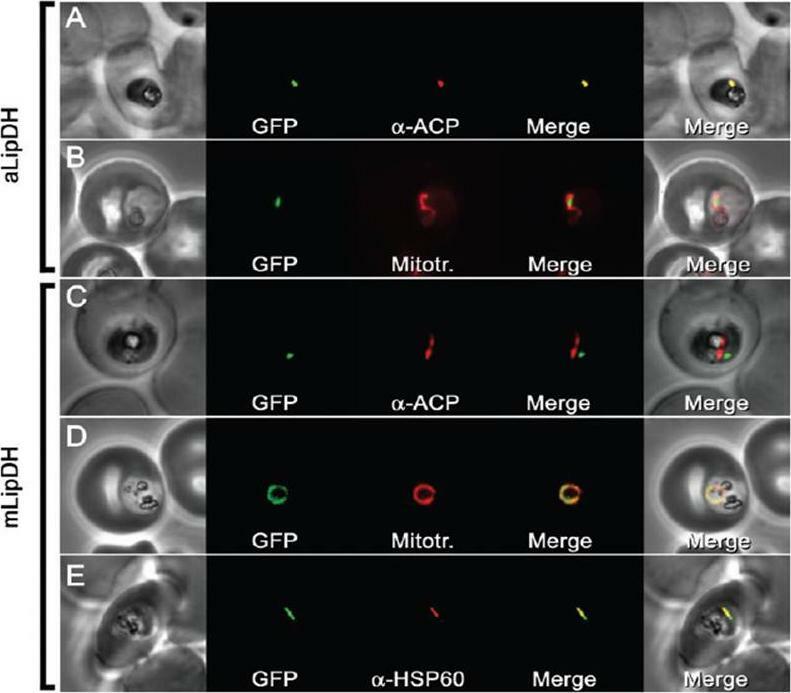 The localization of aLipDH and mLipDH was investigated by expressing the putative N-terminal presequences fused to GFP in P. falciparum intraerythrocytic parasites. A and B. Colocalization with antibodies directed against the apicoplast-resident acyl-carrier protein PFB0385w (ACP; A) and with MitoTracker Red (B) demonstrates that the putative apicoplast targeting presequence of aLipDH targets the marker protein GFP exclusively to the apicoplast. C–E. Colocalization experiments with the apicoplast protein ACP (C) and with the two mitochondrial markers MitoTracker Red and HSP60 PF10_0153 (D and E) indicate that mLipDH is localized exclusively in the mitochondrion.McMillan PJ, Stimmler LM, Foth BJ, McFadden GI, Müller S. The human malaria parasite Plasmodium falciparum possesses two distinct dihydrolipoamide dehydrogenases. Mol Microbiol. 2005 55:27-38. Copyright John Wiley & Sons Ltd. 2010.